NHS Choices is the UK’s biggest healthcare website. 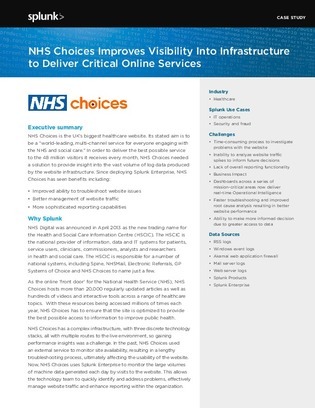 In order to deliver the best service to the 48 million visitors it receives every month, NHS Choices needed a tool to provide insight into the log data produced by the website infrastructure. Find out more about the benefits NHS is experiencing since implementing Splunk Enterprise in this case study.